Who cares about steps when the views are like THIS? 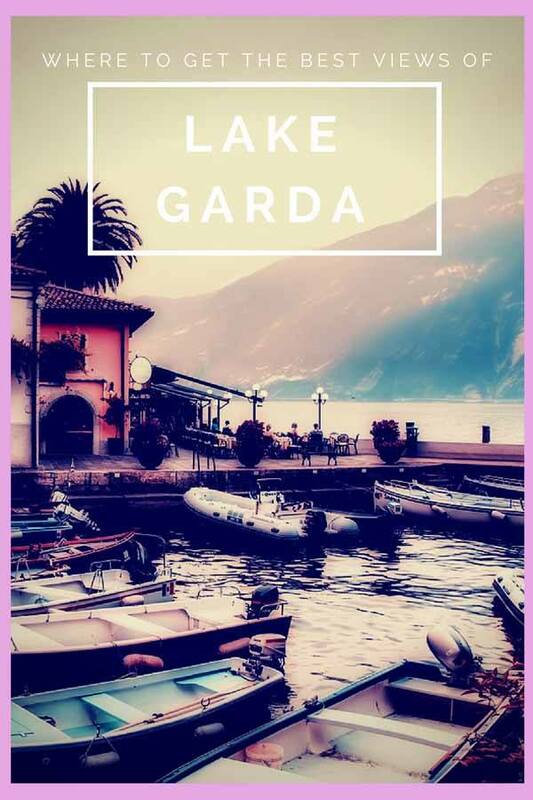 Are you looking for the best scenic Lake Garda views? 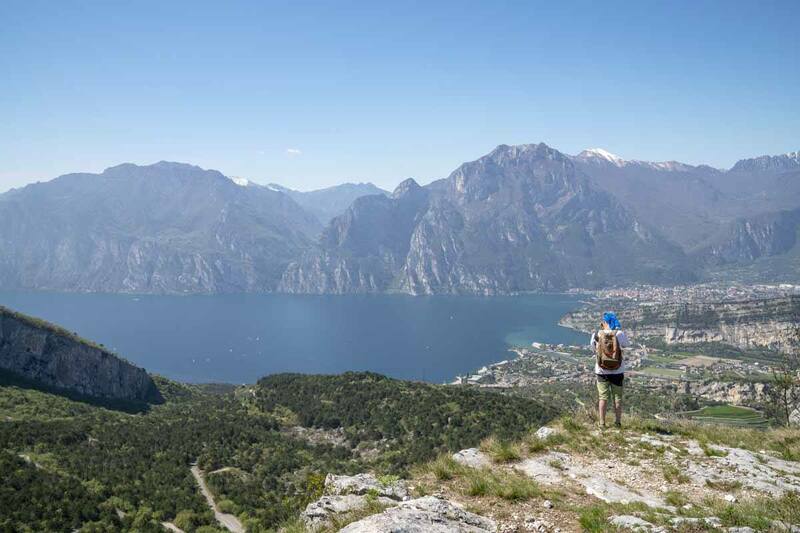 Look no further – this day hike will take you through some of the most scenic paths overlooking the northern part of the lake, including the famous Sentiero Busatte-Tempesta! 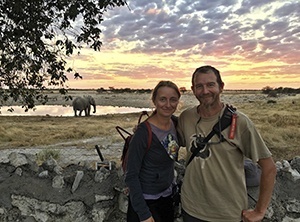 First things first – we’ve been hiking for the last ten years, in places as far afield as Kyrgyzstan, Finland, and Madagascar, but I’ve been on few hikes as amazing our last adventure along GardaTrek. If there ever was a perfect hike, it would probably be it. 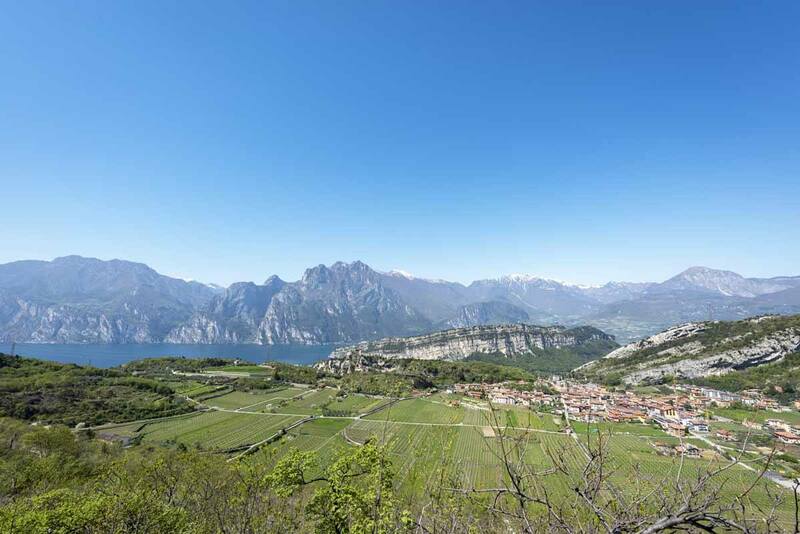 It was not too long, not too strenuous, yet we were surrounded by spectacular scenic Lake Garda views the whole day – from the moment we set foot our of our hotel in Torbole, to when we returned eight hour later. We were only supposed to be gone for five hours, but such is life. The northern side of Lake Garda is an ‘in between’ kind of place. Between the Alps and the Mediterranean. Between palms, olive trees, bougainvillea and pine trees. Between Italy and Germany. So, it comes as no surprise that its seasons also feel in between two times of the year. Spring in Lake Garda… but feels like summer! This outing was our last in the project of hiking GardaTrek in four seasons – during each of our hikes we were able to experience not only the current season, but also the one that was about to begin. In the course of our summer hike to Rifugio Pernici, we saw the first traces of autumn, despite the stifling heat. When we hiked Monte Altissimo in autumn, we woke enveloped by a chilly, wintry frog. Our winter hike was on a warm, sunny days, and we saw nature waking up again all around us – and our spring hike almost felt as if it was well and truly summer. The departure point of our hike was Torbole – specifically, we started walking from Aktivhotel Santalucia, conveniently located at the beginning of the trail heading up the valley of the same name. One turn after the other, we made our way through olive groves to Nago, Torbole’s twin village located about 200 meters above. The Valletta di Santa Lucia (Santa Lucia Valley) is not just like any other – it was the scene of an extraordinary military feat that took place in the early days of the 15th century. During those days, the Republic of Venice was at war with the duchy of Milan. The Milanese fleet was stationed on Lake Garda, effectively surrounding the last Venetian strongholds. Can you believe it? Ships were CARRIED down this valley! However, the Venetian had an ace up their sleeves – they sailed their galleys up the Adige River, and transported them overland up Santa Lucia Valley, surprising the Milanese just below that couldn’t possibly dream that ships would be coming towards them from the mountains. 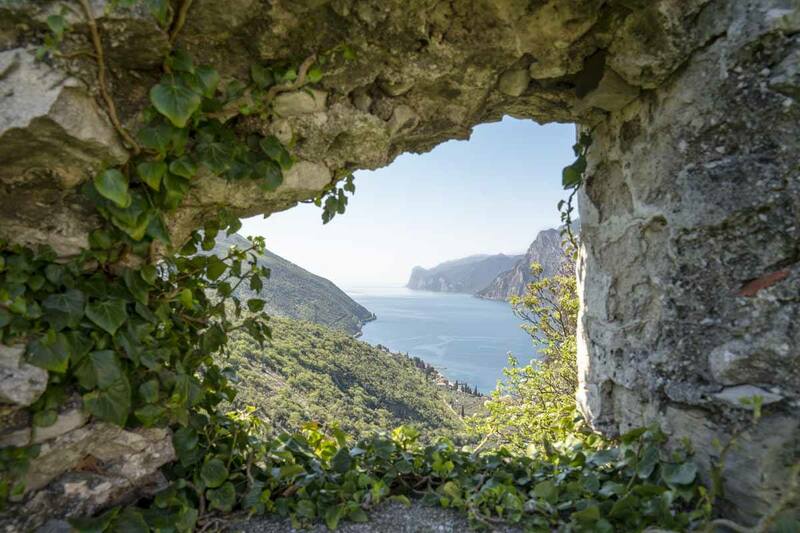 Once you reach Nago, you have the opportunity to take a quick detour up to Penede Castle, the fort from where the Venetian commanders engineered this incredible operation. 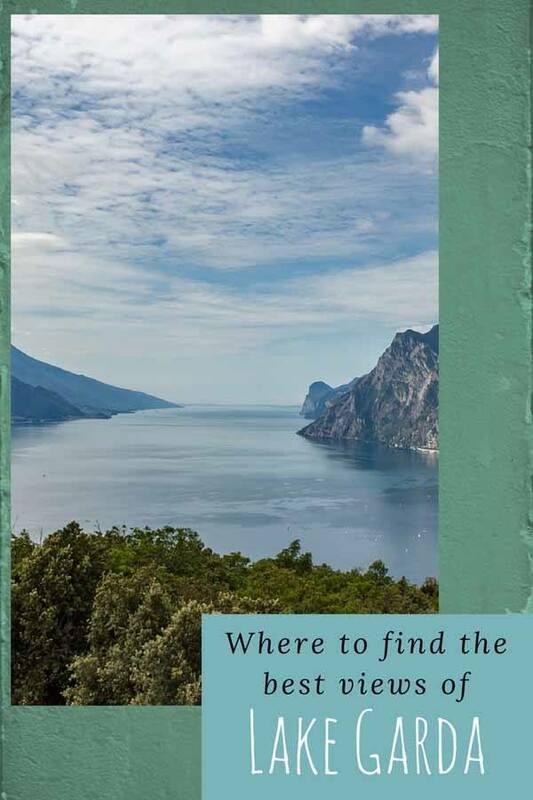 There’s also a scenic view over Lake Garda from the castle, just follow the sign saying ‘castello’ you see under an arch not as soon as you enter Nago, pointing to your left hand side. After Nago, follow the signs for path number 601, pointing towards Malga Zures. The path is fairly wide and well maintained, and climbs gradually over limestone rocks and deciduous forests, until the views open up and the northern shore of the lake appears, shimmering under the glittery midday sun. The more you climb, the better the views get – there’s the lake extending southwards, hemmed in by mountains on two sides. There’s Riva del Garda with its bars and restaurants, looking like a toy town from up above. There’s Mount Brione, slicing across the northern shore like a scythe. Path number 601 overlaps the Sentiero della Pace (Peace Path) for a short stretch, a hiking path joining WW1 locations around the northern shore of the lake, which saw some fierce fighting between the Austrian and Italian forces during the war. After walking through a small patch of forest, you’ll reach a WW1 fort and some trenches – you can either walk on the edge of the trenches or into them, as the path runs in the same direction. The area was the scene of a battle, on December 30th, 1915 – the Italian infantry tried to take Malga Zures from the Austrian troops, but failed. 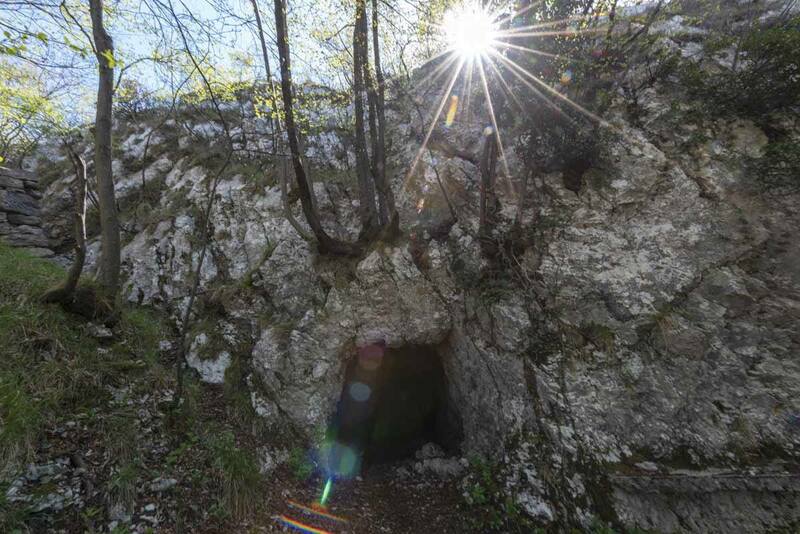 The Malga remained in Austrian hands until the end of the war, establishing the frontline across the mountains just north of Lake Garda, explaining the abundance of WW1 history in the region. After about an hour after leaving Nago, you’ll reach the top of a limestone crag – if you’re brave enough you can sit dangling your feel below, truly suspended between the mountains and the lake. In any case, it’s a wonderful lunch spot! Not a bad place for lunch, right? Twenty minutes or so later we reached Malga Zures, the highest point of the hike at about 700 meters. Despite its wartime importance, there’s nothing really to see there – the Malga is only open in summer, there’s a small chapel and some signs in memory of WW1 events, but no views nor anywhere to buy drinks. If you’re planning to have your lunch at Malga Zures before starting your descent, we would advise against doing so – stop at the crag I mentioned before, and take in those glorious vistas. From Malga Zures, it’s time to start your descent. Follow the path leading down to Torbole – this path doesn’t have a number, but the turn is clearly marked with a red and white sign reading 2 hours and 10 minutes, and I bet you’ll be thinking that it can’t possibly take that long, right? Well, you’d be mistaken. The start of the descent is the least pleasant part of the hike – the trail is steep, rocky and slippery, for about 45 minutes. If you’ve got your hiking poles with you, they’ll come in handy – otherwise, see if you can find a fallen branch to use instead. There’s not much in terms of sights during this section – just watch your step and try not to fall. Trust me, it’s much steeper than it looks! By the time the steep descent ends, you’ll be thinking you’re almost at the bottom, and it will be a flattish hike all the way to Torbole. But you’d be mistaken. 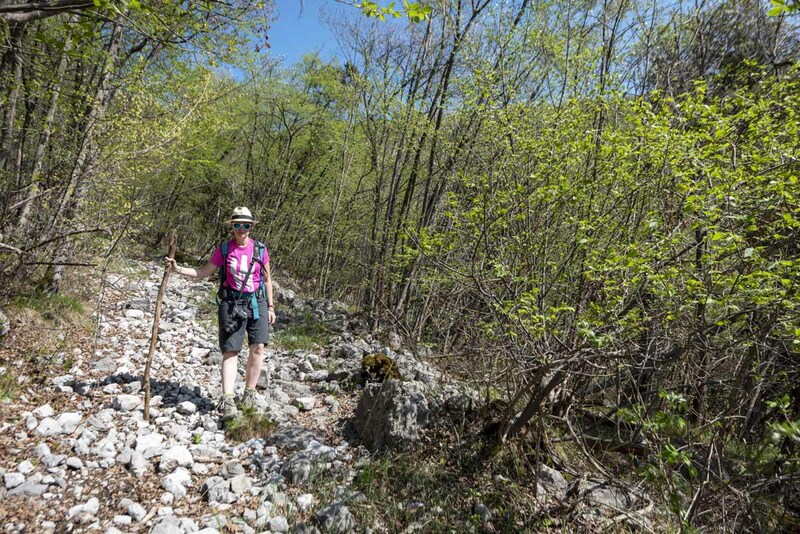 The northeastern tip of Lake Garda is bordered by steep slopes, some of which collapsed over the centuries, creating boulder fields and sheer cliffs – once you get there, you’ll realise you can’t possibly have a flat path. 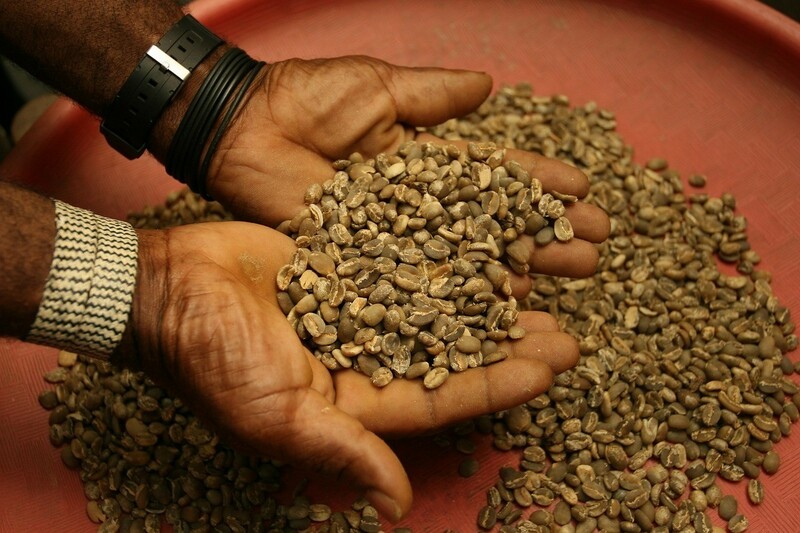 Follow the directions for Sentiero Busatte-Tempesta, the best surprise of the day. The most scenic part of the hike is about to begin! See what I mean? 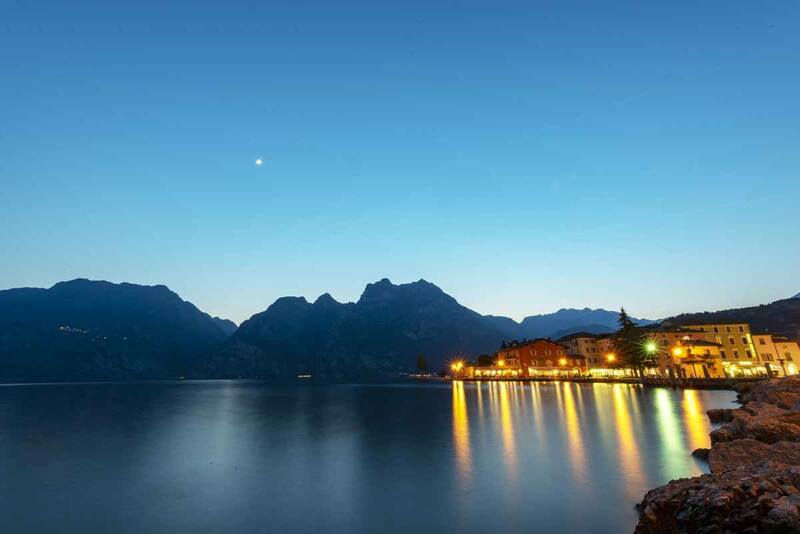 Isn’t this the best possible Lake Garda panorama? Sentiero Busatte-Tempesta is fairly flat at the start, with some signs providing info about local flora, fauna and geology. Torbole is visible in the distance, just as the lake bends. Then, we noticed there was a rocky slope in our way, evidence of the unstable geology I mentioned above. The slope had metal stairs bolted on, all going uphill. The same thought crossed both our minds. Surely, it can’t be… we’re supposed to be going DOWN! But yes, it was. The Sentiero climbs gradually towards the metal stairs – there were 14 or 15 flights in total, about 400 steps, all going up. It was fairly hard to climb them all, with the heat and the exertion of the day. The sun was still shining bright, and the stairs seemed never ending. We joked that Escher must have designed the path – how could we possibly be heading downhill, while climbing so many steps? 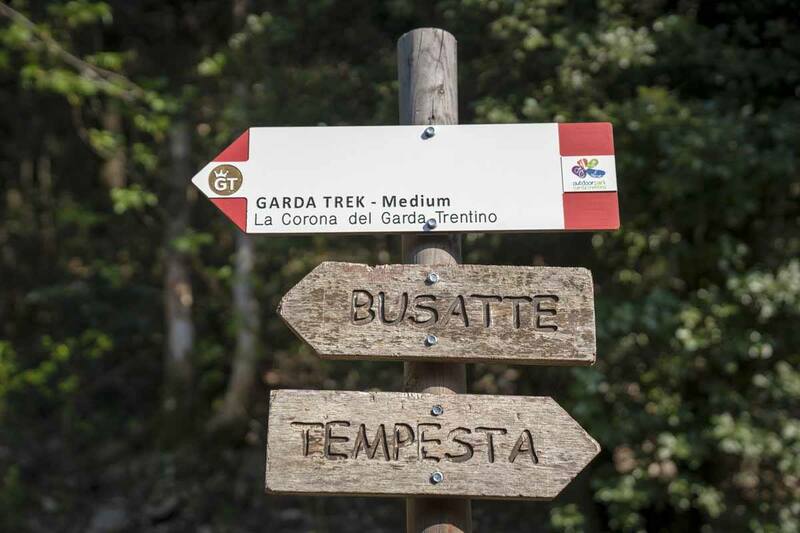 Don’t miss hiking Sentiero Busatte-Tempesta! Yet, the views over the lake were unreal. After 6 trips to Lake Garda, we had finally found the best scenic views! We were in a place so beautiful, so perfect, so peaceful, that we just didn’t want the path to end. The path is truly suspended between the lake, the mountains and the sky – there were sailboats crossing the lake, leaving a thin slice of spray in their wake, paragliders zipping overhead, and the noises of the forest all around us. Just as the sun was about to set, we stood on a viewpoint and looked at the lake extending southwards, hidden behind a veil of mist surrounding the horizon. We looked at the mountains surrounding us, guarding the lake as if it were an ancient Neverland. We looked at the sky, just about to hit the first chords of that symphony called sunset. I opened my mouth, but the wind blew my words away. Because in front of so much beauty, silence is all that’s needed. 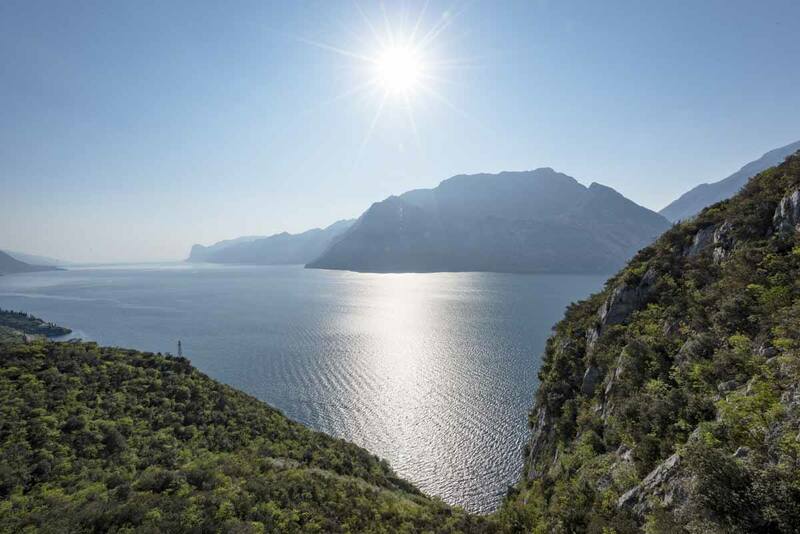 One of the most spectacular hikes of our lives – so many reasons to love Lake Garda! 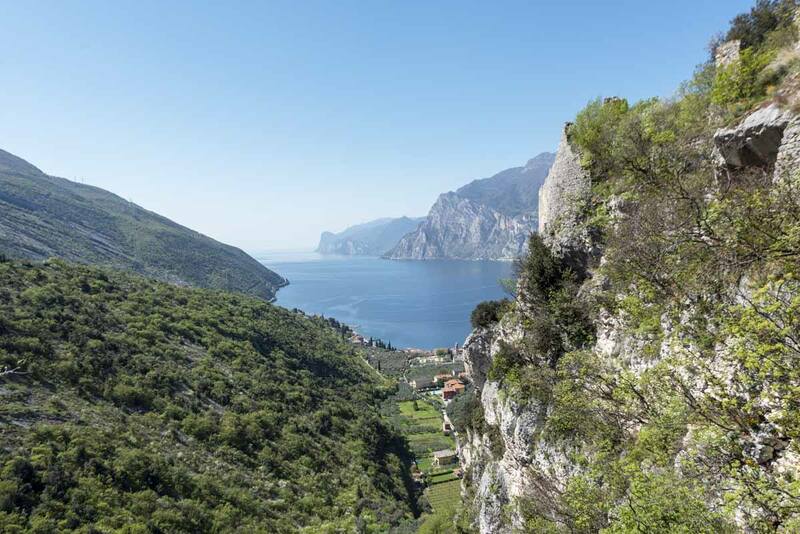 It’s easy to reach Torbole, the departure point of your hike – if you’re driving we recommend taking the A22 to Rovereto Sud and following signs to Torbole. Otherwise, take the train to Rovereto and then a bus headed to Riva del Garda, stopping in Torbole. 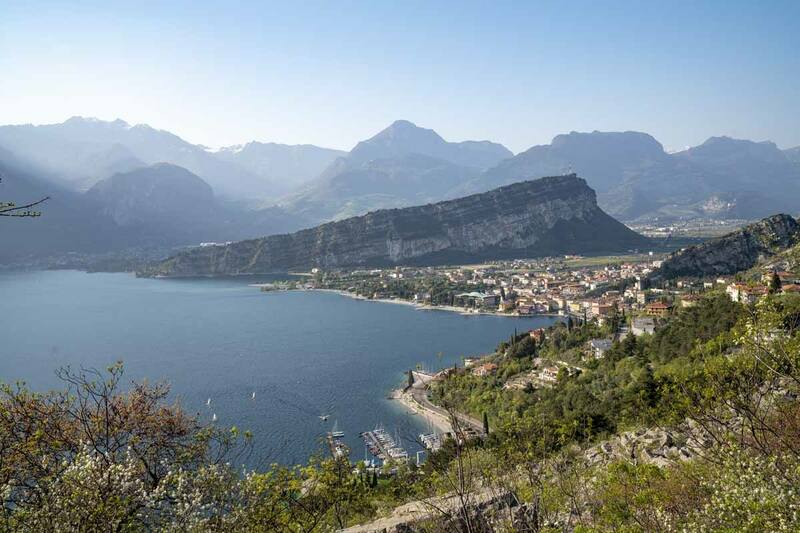 This hike is a loop and takes approximately 5 hours to complete – but allow more time, as the scenic views over Lake Garda will blow your mind! 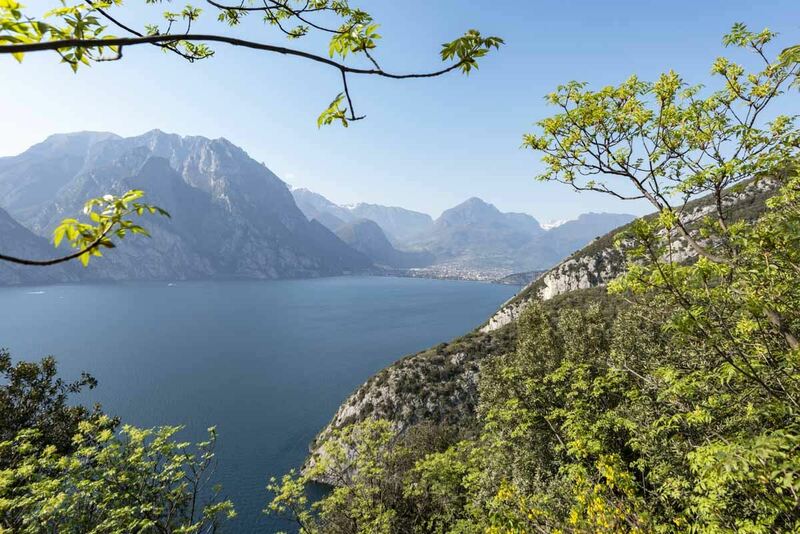 Similarly to many other places around Lake Garda, parking in Torbole can be a hassle in summer – Aktivhotel has a car park and it’s perfect for hikers, with a lovely outdoor swimming pool surrounded by a garden. 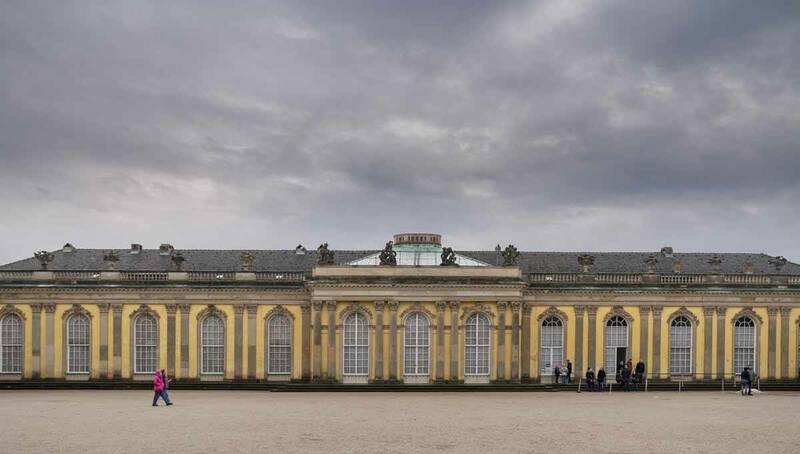 There are also free wine tastings a couple of times a week! 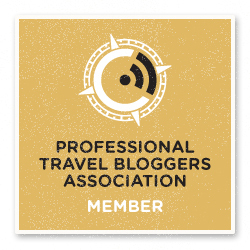 We would like to thank Vale Bellotti from Garda Trentino for making this experience possible. Once again, GardaTrentino rocks!